Pool Billiards Supplies Dot Com was started back in early 2008. 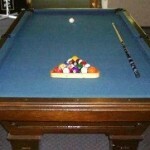 Billiards is a great game and this site is about anything pool and billiards. This is a nice platform to write about anything from pool tables or pool cues to hand chalk and billiards chalk. Knowledge is one of the best billiard supplies you can have. You will find some great billiards instruction here and you are encouraged to comment with your opinions and advice. Knowing all you can about how to play billiards and knowing about billiards equipment available can enhance the game for you in a big way. Please feel free to leave pool and billiards related comments as you wish. Let’s get the info flowing and make this a giant pool school. Comments from billiards fundamentals to advanced pool playing tips and tricks will be appreciated by all. Let’s help everyone learn how to play pool at a higher level. Due to a poor hosting company, all of the original content was lost. This is the first post in the revival of the site. I will attempt to retrieve what I can from the original content from article sites where some of the posts where published. It’s good to have http://www.poolbilliardssupplies.com back on line. Where do you get your billiards supplies? If you are into pool and billiards and you are like many players, you are always on the lookout for some cool billiard supplies. I am one of those guys who is running around the vending booth trying to purchase that product that I put off for the entire pool tournament. Now the vendors are packing up and I am trying to finally make that purchase. When you know the name brands and values, purchasing on line matches the quality and the convenience is fantastic. I recently set up a page which is pretty cool. It is a hub for live auctions and it is targeted to specific billiards supplies. I bought my last 2 pool cues from these on line auctions. Check out the “Billiards Supplies Hub” Here. Are you working on improving your pool game? Check out the Free training on Billiards Fundamentals . I hope you find some cool billiard supplies with the links in this post. When you are on the auction sites, use the search features on the top of the pages. My pool game is pretty strong these days. When we look at our past record of playing that billiard game pool, I think most of us will find that our game improves as time rolls by. This holds true for those of us who play pool on a regular basis anyway. It seems that players will increase their skill level and then plateau for a while and or possibly even go into a slump. When we play through the slump however, we usually notice improvement in our game and then continued improvement until the next plateau. I know for me this cycle has occurred numerous times over the past 20 years. The last several years, the slump is only obvious to me. My game is pretty strong about any day and even though I know I’m in a bit of a slump or that I could be playing better. When you are evaluating your own pool game or you are down on your game, remember that when you shoot your way out of the slump, you will be playing better than ever. Shooting some billiard drills is a good way to accelerate your way through a slump. Sometimes a good competitive match for some money or a nice friendly bet will do the same thing. How strong is your game? Do you run racks on a regular basis? Do you need a few innings to complete a game? Have you ever studied the fundamentals of billiards? If you have not studied the fundamentals or you don’t know any practice drills, then I would suggest that you learn both. You can find almost anything on line and my blog will lead you to some cool resources. There is even a free billiards fundamental course on my blog. Learning the fundamentals and shooting some practice drills can improve your game in many ways. It will boost your confidence and the tougher shots will become routine for you. You will know which shot to take and which path the cue ball will take. You will notice huge improvements in your over all pool game. Leave a comment with your thoughts, questions and stories on this article. I would love to hear from you and I’m sure others who read this in the future would enjoy that as well. Original post from Wed. Feb 20 2008. Thanks to the way back website, I am still retrieving the old content for this blog. Don’t you just love to play pool? I love to play pool. We had a league match last night and while taking a few practice shots before the match, it dawned on me that after playing the game for over 25 years, I still love to play. Last nights match was short and sweet. The opposing team was short a player, which set the stage for a quick match since we only had to play 20 games instead of the normal 25. I played 3rd and the score was one to one when I played my first game. I won the coin toss and started with a pretty decent break. I pocketed a ball on the break and proceeded to clear the rack. I shot a nice break out on my only trouble ball, put down all the stripes and my cue ball rolled kind of funny on the 8 ball. I had a long shot on the 8 and barely had room to clear one of my opponents solid balls. The eight ball hit that solid ball on the way by and the 8 didn’t fall. The next shot I took was following a safety from my opponent and it was a Masse kick shot. I made a good hit on the 8 and spun my cue ball to a nice spot leaving my opponent a tough shot. He missed, I shot the 8 in the corner and our team was ahead 2 to 1. I could have picked up $1 from each of my team mates if I had made the first 8 ball attempt. We pay one dollar on the run. I had no run outs last night as opposed to last week when I had 2. I did have to pay out on a few runs. Two of my team mates were in the zone. I went on to finish the night with 3 wins and one loss. Our team won by a land slide. It was a drag for the opposing team because they had to give us 5 games due to their missing player. Another post I found on the way back website archives. Kind of cool I am able to retrieve quite a bit of the original content from this site. Billiard Accessories. How many are there and what are they? Billiard accessories is a pretty broad category. If you are in to playing pool and billiards then you have probably purchased some type of accessory in the past. Some of the pool and billiard items which you could be looking for are billiards tables (pool tables), table covers, pool cues, billiard chalk, hand chalk, chalk holders, cue tips, table brushes, rack (racking balls), trays (carrying billiard balls), glue and clamps for repairing tips, sand paper, tip scuffers, tip tappers, tip shapers, billiard ball cleaner, training books, training videos, etc. Above is a list of twenty different kinds of billiard accessories. We didn’t even cover the wide variety of mechanical bridges available or the aim trainers and other teaching products. Let’s not forget the table brushes and products for cleaning the chalk off of your felt. How about pool cue cases and those clamps that hook to a dining table in the tavern or pool hall that holds the cues in an upright standing position? There is a whole other grouping of billiard accessories where table repair is concerned. There is billiard cloth, adhesive for covering your table, staples, rails and rubber, and pocket inserts. I did a search on Google for billiard accessories and came up with 834,000 results. Yes that is eight hundred and thirty four thousand. With all of these choices, how do we decide where to get them? I make sure that I know what I am looking for. I read up on name brands and try to find some reviews. I then shop for price and a merchant that I can trust. I prefer to buy most of my billiard accessories on line. I have been known to make several purchases from vendors at tournaments and billiards trade shows however. I like to purchase on line, because it is laid back and I get the item delivered to my door. I almost never find myself in the billiard supplies store and I am always doing something on line. Buying on line is down right convenient. I hope you enjoyed this article and I would love to hear your comments questions and stories. Subscribe to the RSS feed on the upper right corner of this blog and get articles like this delivered to your desk top. I found some of the old content from this site with web archive dot org. This post was published January 18th of 2008. I found several posts from 2008, but none from 2009 or 2010. Oh well. I will be posting some of the old posts until I get all of the content available back here on the site.